The program is expected to greatly improve access to quality community ICU health care and to save more than $18 million over three years. Staff and residents introduce the new Physician Assistant - Nurse Practitioner Residency Program at the Emory Center for Critical Care. Emory University has received a $10.7 million Health Care Innovations Award from the federal Centers for Medicare and Medicaid Services (CMS) for its plan to build a collaborative network supporting intensive care units in North Georgia. By combining specialty training for nurse practitioners and physician assistants with telemedicine intensive care services, the collaborative will improve critical care for patients in rural and underserved areas. Health and Human Services Secretary Kathleen Sebelius today announced that Emory University's Center for Critical Care is among the first cohort of organizations for Health Care Innovation awards. Made possible by the health care law – the Affordable Care Act – the awards will support 26 innovative projects nationwide that will save money, deliver high quality medical care and enhance the health care workforce. The preliminary awardees announced today expect to reduce health spending by $254 million over the next three years. "We can't wait to support innovative projects that will save money and make our health care system stronger," said Secretary Sebelius. "It's yet another way we are supporting local communities now in their efforts to provide better care and lower cost." Emory Healthcare will partner with Saint Joseph's Health System, Northeast Georgia Health System, Southern Regional Medical Center, and telemedicine provider Philips Healthcare to train nurse practitioners and physician assistants as critical care specialists and integrate telemedicine ICU ("tele-ICU") services into community hospitals to allow remote support, advice and supervision by experienced critical care doctors and nurses. The program is expected to greatly improve access to quality community ICU health care and to save more than $18 million over three years. "As our population ages, more and more Americans will require an admission to an intensive care unit," says Timothy Buchman, director of the Emory Center for Critical Care and architect of the North Georgia Critical Care Collaborative (NGCCC). "Those patients and their families depend on getting the right care – right now, through life-supporting treatments that require not only advanced technology but also a team of skilled caregivers." "Northeast Georgia Health System is pleased to be part of such an important initiative that will improve the quality of critical care throughout the northeast Georgia region we serve," says James Bailey, chief medical informatics officer at Northeast Georgia Health System and co-director of the NGCCC. "As a regional provider of tertiary care services in northeast Georgia, NGHS is excited to partner with Emory and the other collaborative partners in developing an innovative ICU care model that can help the entire region." 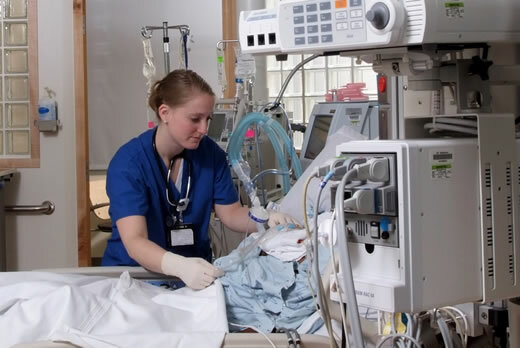 Delivery of quality critical care is under extreme pressure because of the decrease in critical care providers, causing many intensive care units to close and requiring families to travel far from home seeking increasingly scare ICU beds, often leaving their jobs and families at home. Emory University and its community partners will help solve this problem by bringing more than 40 critical care professionals, including 20 nurse practitioners and physician assistants, from their local hospitals and communities to Emory for six months' advanced training in Emory's schools of medicine and nursing. Once trained, they will return to their community hospitals to provide high-quality care, enabled by telemedicine ICU services. This central tele-ICU team will give patients, families, and community hospitals the benefit of around-the-clock, two-way audiovisual consultation, monitoring and advice from a highly experienced ICU doctor and critical care nurse working with a specially trained provider continuously present in the community ICU. The tele-medicine system also will support additional clinical, technical and administrative professionals who form the local hospital critical care teams. "This new regional program in critical care medicine represents the ideal alignment of our three-part mission of patient care, education and research," says Wright Caughman, executive vice president for health affairs and CEO of the Woodruff Health Sciences Center at Emory University. "It also is an extraordinary partnership among the federal government, community hospitals and the expertise of our academic health science center. This is a collaborative effort that brings together Emory's model of critical care delivery with our community partners to promote quality and efficiency in health care for all of Georgia's citizens. We are honored to play a part in improving critical care in North Georgia's underserved communities." Emory University School of Medicine and Emory's Nell Hodgson Woodruff School of Nursing have a long tradition and nationally recognized programs to train acute care nurse practitioners and physician assistants to deliver cutting-edge critical care. Beginning nearly three decades ago, Emory began building its program so that each one of the ICUs in Emory Healthcare hospitals is staffed around the clock with specially trained providers who work alongside nurses, respiratory therapists, pharmacists and other members of the critical care team. Emory also offers one of the country's first residencies in critical care for nurse practitioners and physician assistants who want to train for academic leadership.